Metodika zabývající se hodnocením žákù pøi výuce cizích jazykù, èerpá z nejnovìjších poznatkù osvojovování si vìdomostí u dìtí. A state-of-the-art account of what we currently know about how children learn L2s in formal contexts and how that knowledge impacts on the design, development, and evaluation of language assessment products for young learners. The uniqueness of child L2 development within the classroom is highlighted by considering children's L2 needs, typical patterns of development, and the role of instruction and assessment in how children learn. Common issues shared in child L2 acquisition studies, language testing and educational assessment are explored by linking research carried out within the educational, academic and testing communities. Several case studies are described from different educational contexts around the world where teaching and assessment of young language learners takes place. 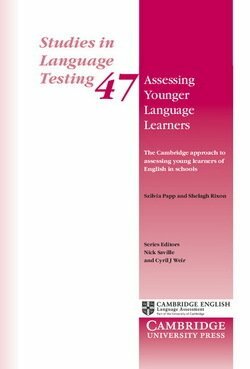 In particular, the book presents the Cambridge English approach to assessing young learners of English and presents a framework for the development, research and validation activities around the Cambridge English suite battery for children.